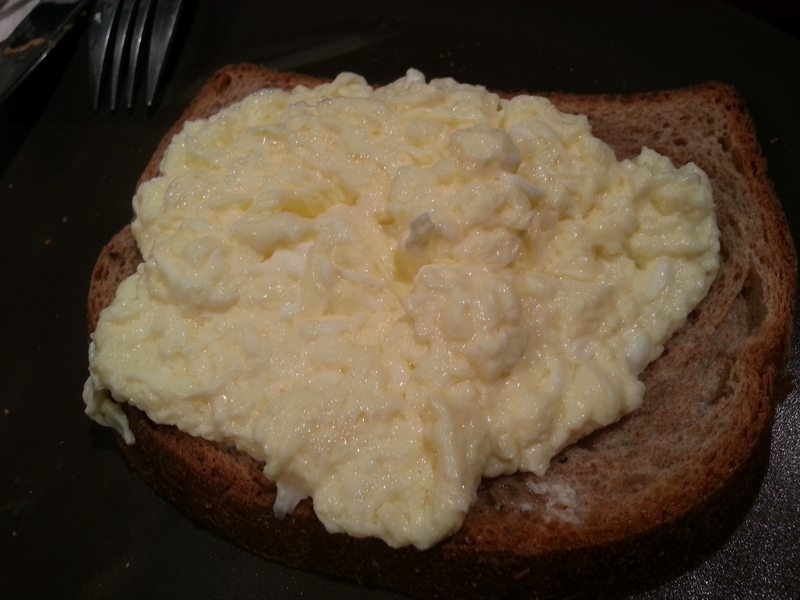 Arthur shared with me this post and I decided to give Daniel Patterson’s “poached scrambled eggs” a try. Short version of the story – it works. Swirling a pot filled with water and dropping beaten eggs into the boiling whirlpool for 20 seconds before straining will create fluffy scrambled eggs. I was skeptical at first about how the eggs would turn out. As the eggs swirled around, I peeked into the pot and saw that the eggs had shredded as it circulated through the whirpool. It didn’t look tasty, and it didn’t even look cooked. It just looked like a messy glob of yellow strings. After straining though, the egg somehow coagulated together and became a nice bed of fluffy eats. I’d definitely recommend trying it at least once, at least because it’s such an interesting and quick way to cook eggs.